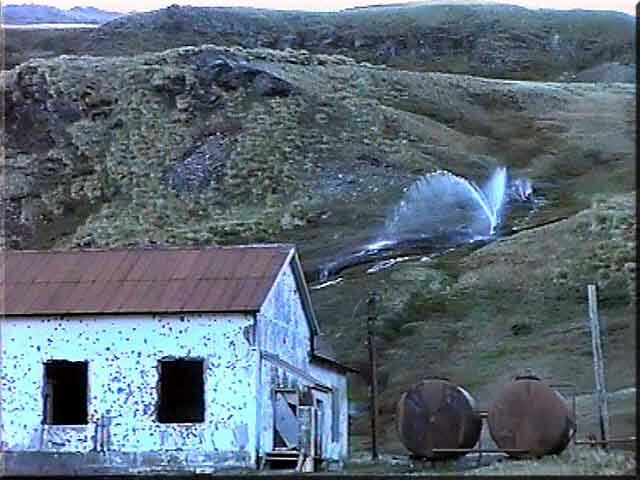 Water was piped to the Power Station at Grytviken from the lake above. 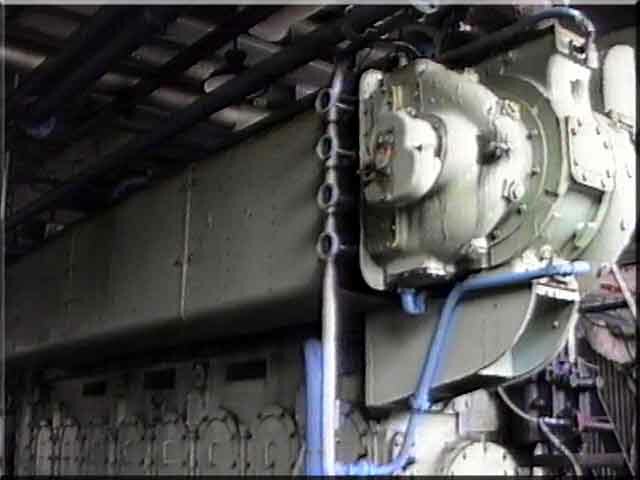 By opening a water valve on one of the turbines and letting the speed build up, the generator could then be connected to the electrical supply board. 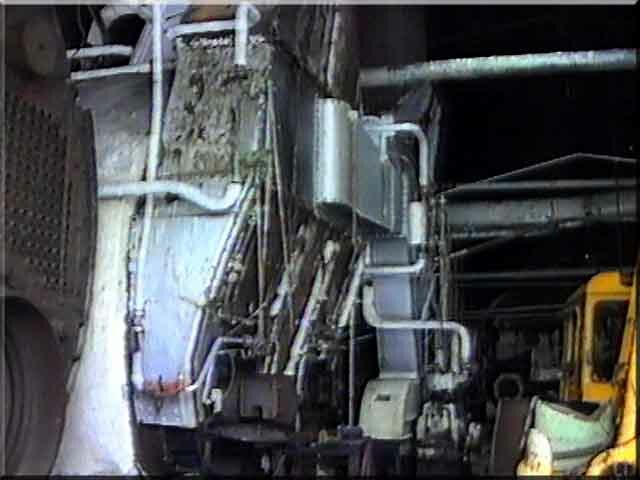 The grey machine on the left is the generator. 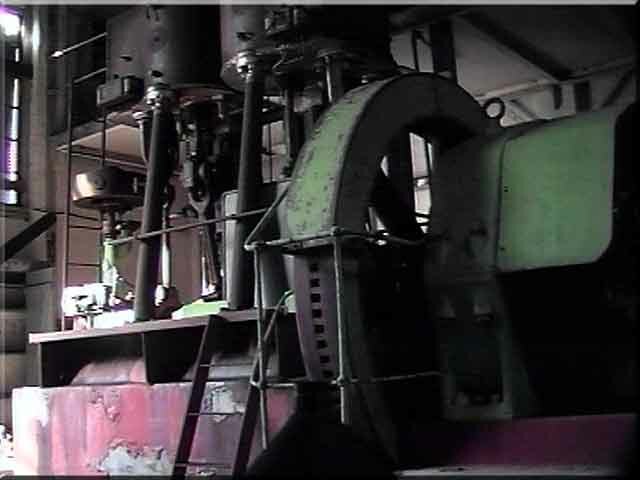 The black unit on the right is the water turbine. In the centre can be seen the coupling and brake unit. The pipeline runs down the hill from the right hand top of the picture to the power station. The disused pipework has sprung a few leaks, one of them seen in the picture above. 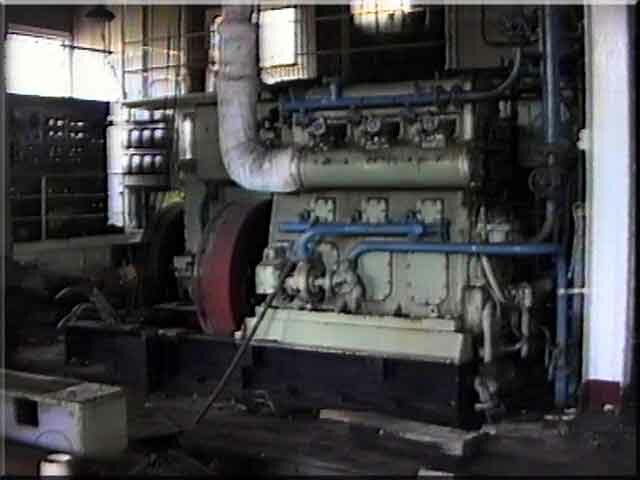 A six cylinder diesel in the Stromness Harbour power plant, showing the generator still connected on the right of the picture. 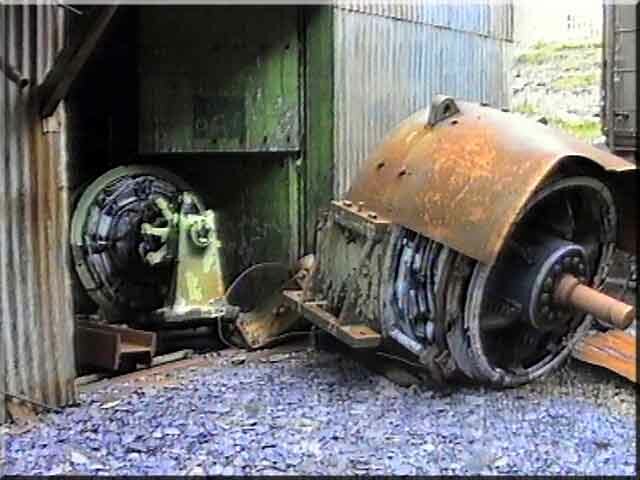 The guards for the flywheel and the coupling are still in place. 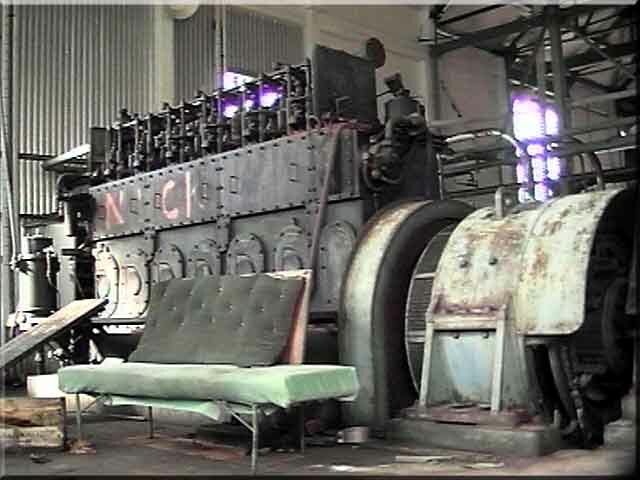 I don't think the "comfy chair" was an original piece of power plant equipment! 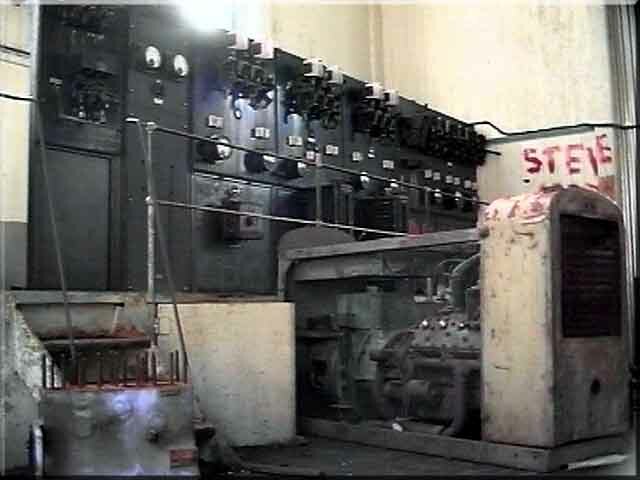 A Ford side-valve (flat top) V8 engine powered generating set at Stromness on the right, and a main generator cylinder head on the left with the main switchboard in the background. One of the main Diesel engines at Leith Harbour. This one is a straight, eight cylinder engine. On the right of the picture is the turbocharger. The blue pipes are fresh water cooling pipes. Another Leith Harbour diesel generating set, this time a small three cylinder diesel engine. The generator having been removed from this one. As well as the cooling water lines, we can also see the circulating pump in the centre of the picture. The main switchboard, again is on the left. Generating sets outside Leith Harbour power station, after removal by "scrap men" in 1982. Old Scotch boilers still litter the foreshore at Leith Harbour. Scotch boiler fronts in the Boiler House at Leith Harbour. 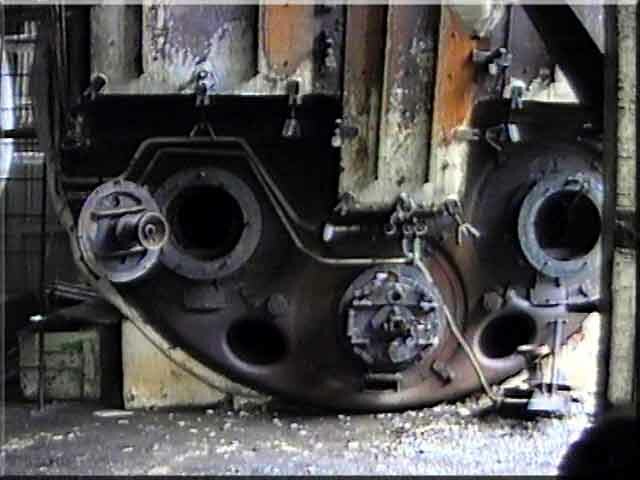 The boilers were oil fired and on the left of the picture one of the furnaces and the boiler tubes can be clearly seen. Another boiler with the front and air space removed. On the left the burner quarl is swung back as it would be to gain entry to the furnace. In the centre the quarl is in the firing position. Above the burner fitting is a small sight glass that the fireman could look through to observe the flame pattern. 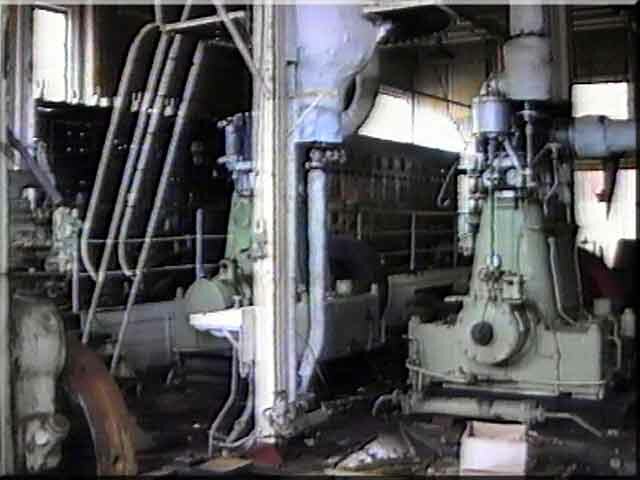 Three steam reciprocating engines in the Leith Harbour power station with the electrical ends removed. Behind the engines we can see the main electrical switch board. 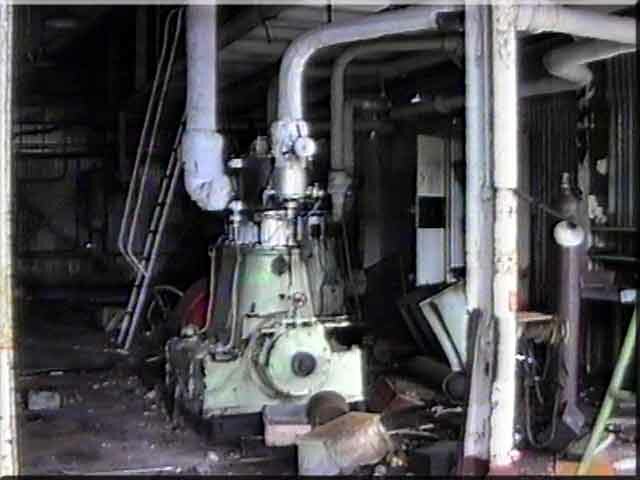 The generators had a high copper content and had been removed by the "scrap men" in 1982. They are still lying in the street outside. Another Leith Harbour steam engine with the generator removed. On the right of the picture are the engineers lockers and just to the left of the engine, the ladder up to the electrical stores loft. Grytviken diesel and water turbine power station. A steady and dependable power supply was necessary to maintain the maximum output, so power generation was extremely important. 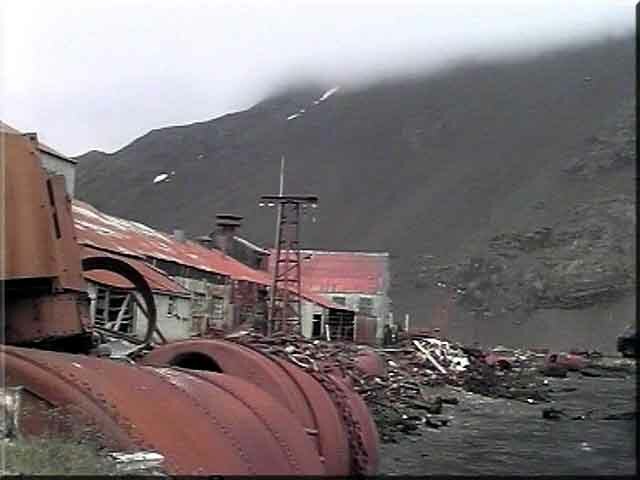 Each of the four whaling stations shown had their own combination of steam and diesel driven generators. 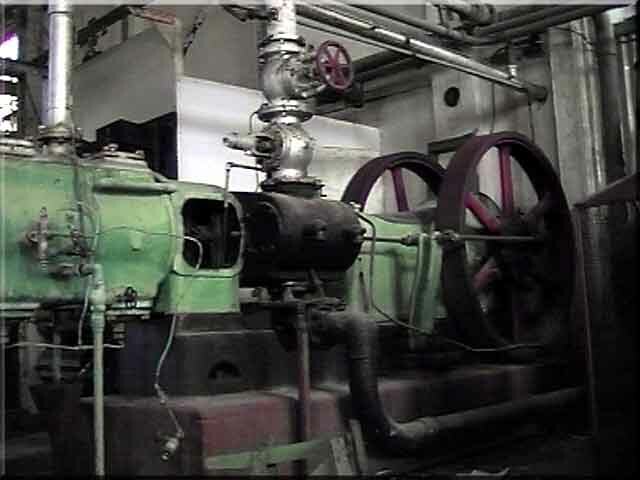 Steam was also used to power machinery, such as winches etc. Some of the "Scotch" boilers used at Leith Harbour may have failed or have been replaced, as they are littered over the foreshore and are also used as supports for one of the jetties. 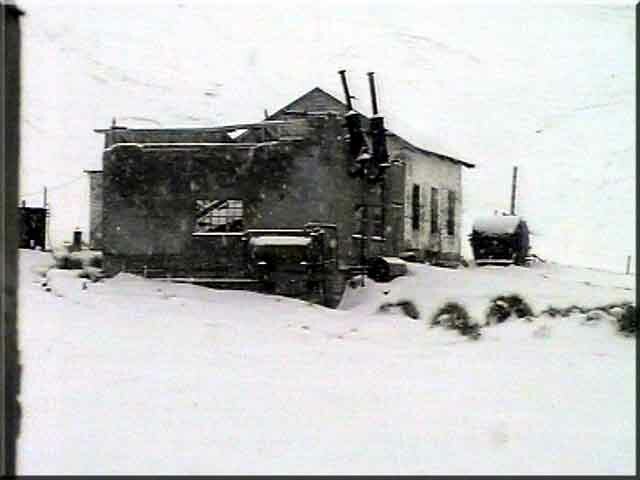 At Grytviken, the power station (above) also had water driven turbine generators. Water from the lake above was piped down to the generating station, and by opening a valve, electricity could be provided very simply and economically. There are slight differences in the steam engines at Leith Harbour and Stromness Harbour, also subtle differences in the diesel plant at Leith and Stromness. 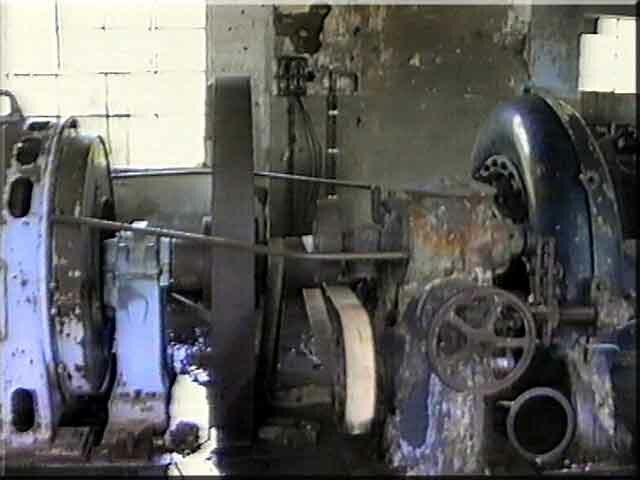 One of the Stromness Power Plant steam engines - note the the square holes in the flywheel for barring the engine over to the starting position. Another nice example of a steam reciprocating engine at Stromness.